Size: -- Choose Size -- 1" x 1/2" 1" x 3/4" 1-1/2" x 1" 1-1/2" x 1-1/4" 1-1/2" x 3/4" 1-1/4" x 1" 1/2" x 1/4" 1/2" x 3/8" 2" x 1-1/2" 2" x 1-1/4" 3/4" x 1/2" 3/4" x 3/8" 3/8" x 1/4"
The Anvil 90-degree reducing elbow is a class 150 malleable iron pipe fitting with female National Pipe Taper (NPT) threads on both ends to connect and change the flow direction between two pipes of different sizes. The elbow has NPT threads for creating tighter seals than straight threads. 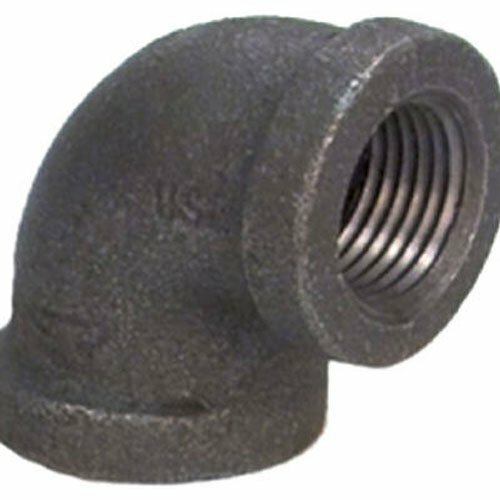 It is made of malleable iron for use with gas, oil, and water applications and has a black finish that helps resist rust in oil and gas applications. 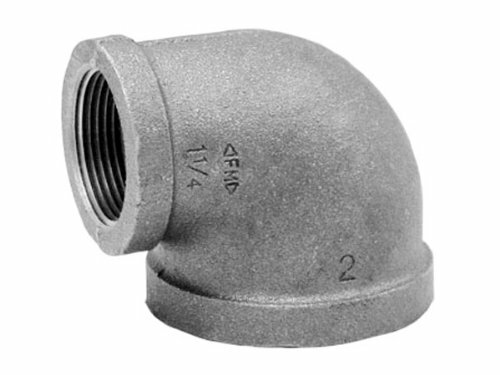 This class 150 fitting meets standards ASTM A-197, ASME B 1.20.1, and ASME B 16.3 for quality assurance. Class is a standard relating to tolerance, construction, dimension, and wall thickness, but it is not a direct measurement of maximum working pressure.